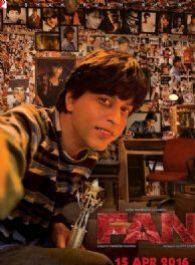 Fan is an upcoming 2016 Indian thriller film directed by Maneesh Sharma and featuring Shah Rukh Khan in the lead role. The film is produced by Aditya Chopra under the banner of Yash Raj Films. The soundtrack album and original score are composed by both Vishal-Shekhar and Andrea Guerra.The film is scheduled for release on 15 April 2016. Ekta Kapoor's Show to be screened for Campa Cola Compound residence?